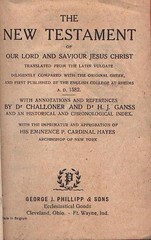 Contents The New Testament according to the Rheims Version as revised by Challoner. Comments NT ends on page 651; Prayers end on page 671; Tables end on page 685. The designation "Made in Belgium" does not appear in this edition. However, it is clearly in this same series. 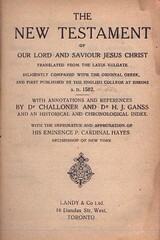 Comments Title page varies slightly from the above edition. 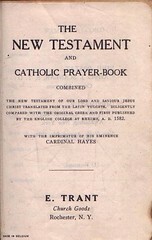 NT ends on page 651; Prayers end on page 671; Tables end on page 685. 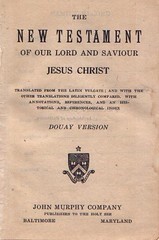 The designation "Made in Belgium" does not appear in this edition. However, it is clearly in this same series. Comments NT ends on page 651; Prayers end on page 671; Tables end on page 685. 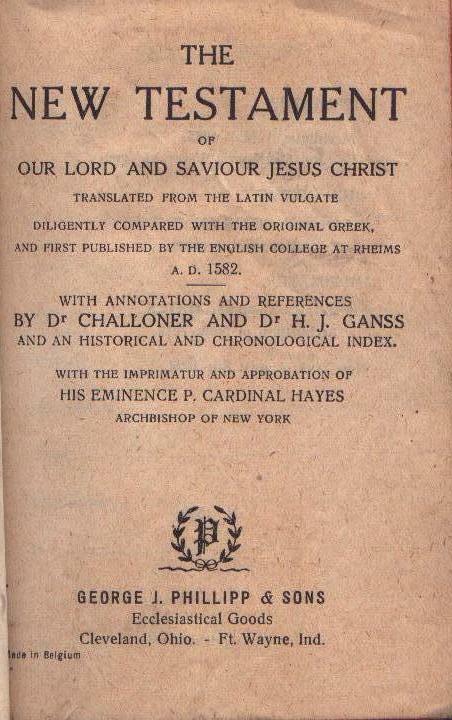 Title The / New Testament / and / Catholic Prayer-Book / Combined / The New Testament of Our Lord and Saviour Jesus / Christ Translated from the Latin Vulgate. 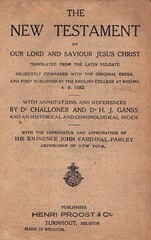 Diligently / Compared with the Original Greek and First Published / by the English College at Rheims, A.D. 1582. 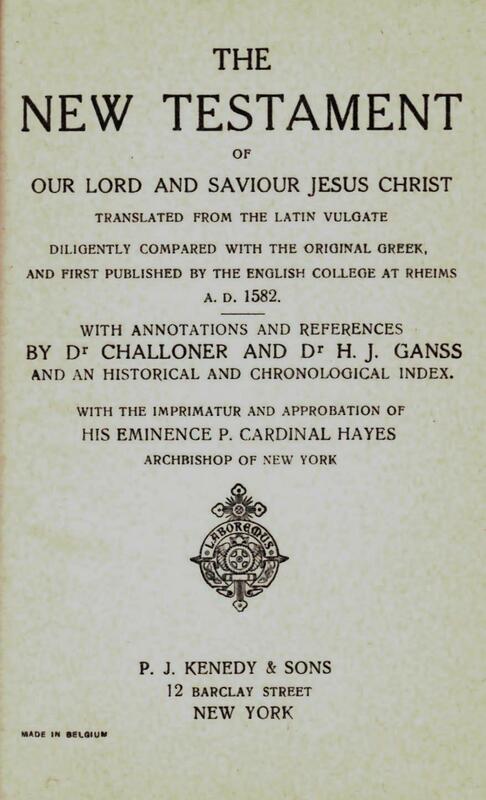 / with Annotations and References / by Dr Challoner and Dr H. J. Ganss, / and an Historical and Chronological Index. 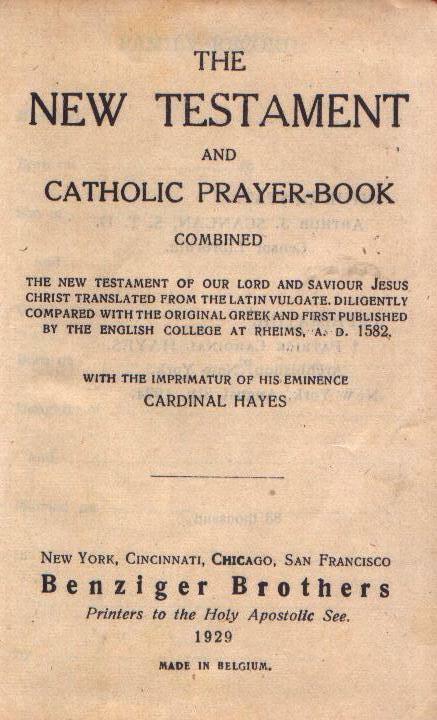 / with the Imprimatur of His Eminence / Cardinal Hayes / New York, Cincinnati, Chicago, San Francisco / Benziger Brothers / Printers to the Holy Apostolic See. / 1929 / Made in Belgium. 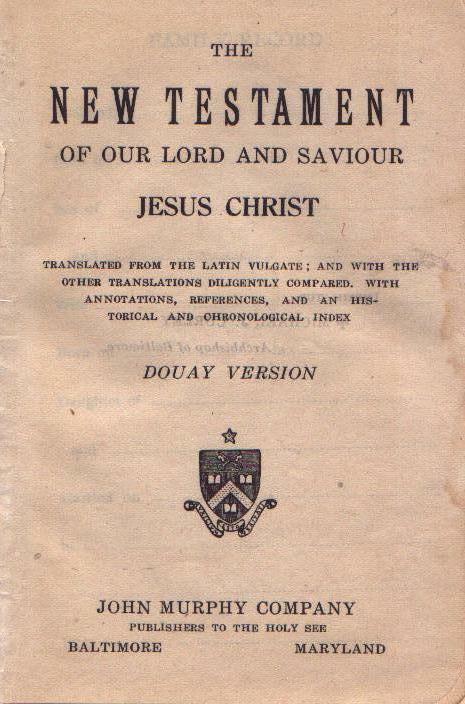 Title The / New Testament / of / Our Lord and Saviour Jesus Christ / Translated from the Latin Vulgate / Diligently Compared with the Original Greek, / and First Published by the English College at Rheims / A.D. 1582. 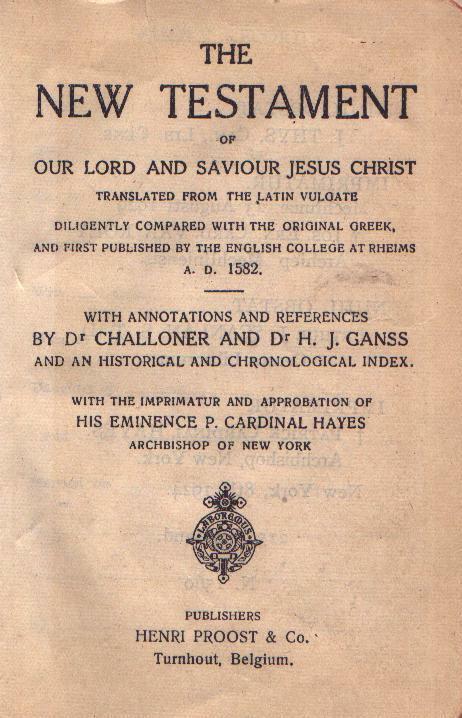 / with Annotations and References / by Dr Challoner and Dr H. J. Ganss, / and an Historical and Chronological Index. 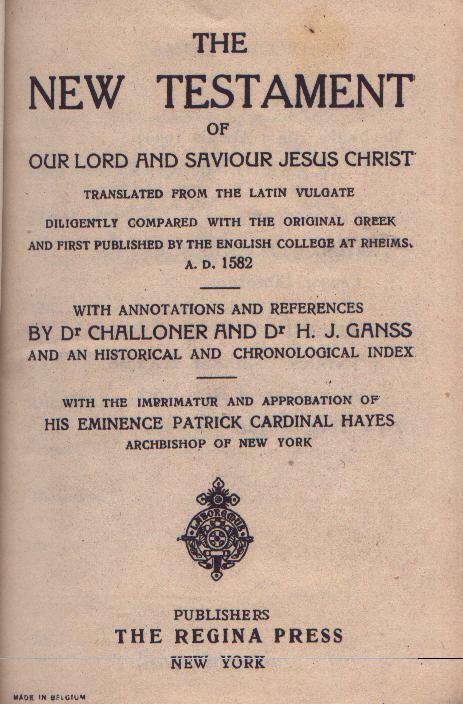 / with the Imprimatur of / His Eminence P. Cardinal Hayes / Archbishop of New York / Publishers / Henri Proost & Co. / Turnhout, Belgium. 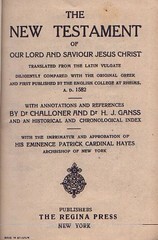 Comments NT ends on page 651; Prayers end on page 671; Tables end on page 685, followed by a 2-page color map. 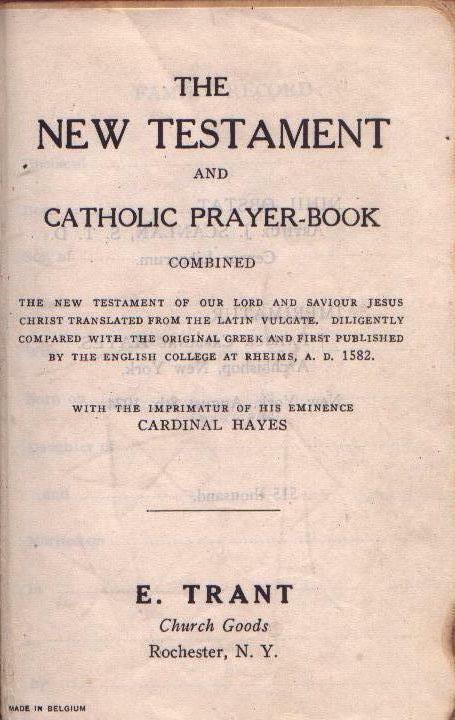 Title The / New Testament / and / Catholic Prayer-Book / Combined / The New Testament of Our Lord and Saviour Jesus / Christ Translated from the Latin Vulgate. 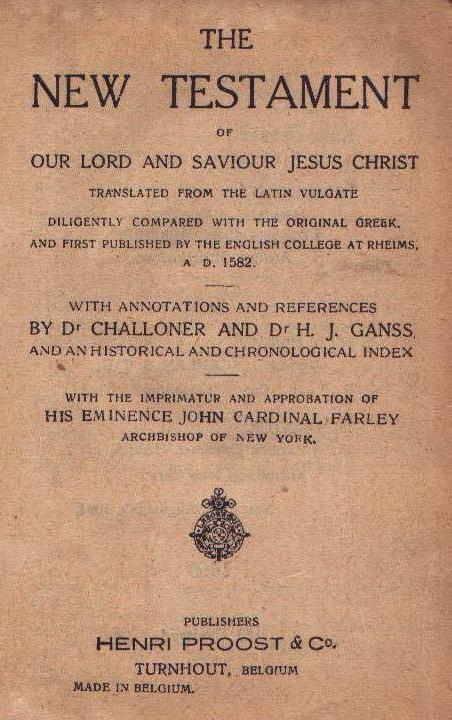 Diligently / Compared with the Original Greek and First Published / by the English College at Rheims, A.D. 1582. 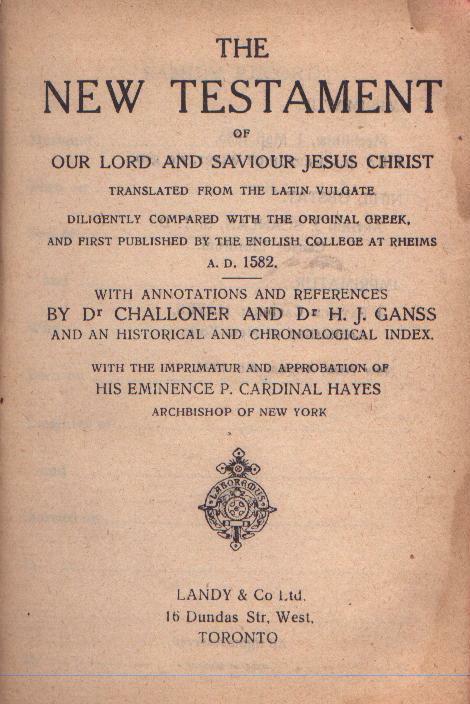 / with the Imprimatur of His Eminence / Cardinal Hayes / E. Trant / Church Goods / Rochester, N.Y. 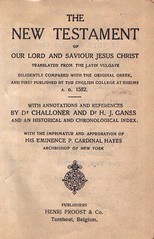 Publisher E. Trant Church Goods, Rochester, N.Y. Comments NT ends on page 651; Prayers end on page 671; Tables end on page 685, followed by an 8-page catalog of books and a 2-page color map. Comments NT ends on page 651; Tables end on page 665. 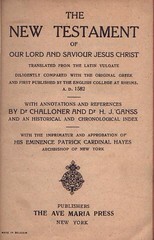 A new edition by the original publisher, showing a new address. Comments NT ends on page 651; Tables end on page 665. 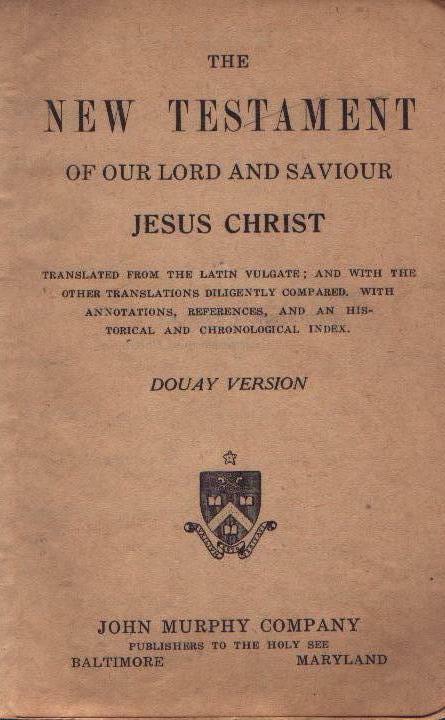 Title The / New Testament / of / Our Lord and Saviour Jesus Christ / Translated from the Latin Vulgate / Diligently Compared with the Original Greek / and First Published by the English College at Rheims. 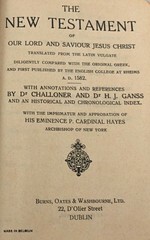 / A.D. 1582. 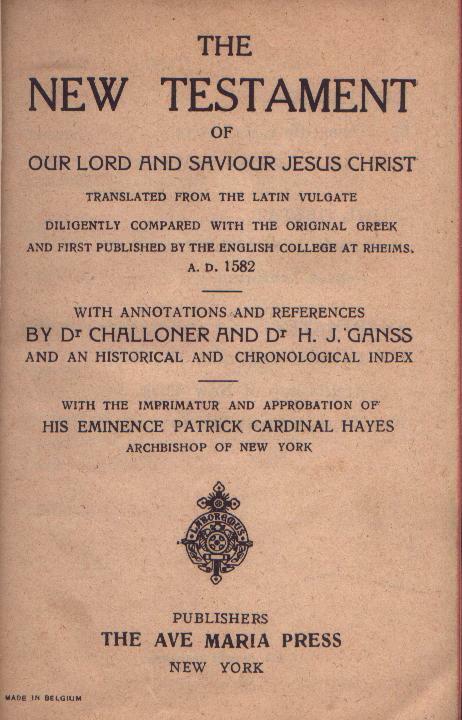 / with Annotations and References / by Dr Challoner and Dr H. J. Ganss / and an Historical and Chronological Index / with the Imprimatur and Approbation of / His Eminence Patrick Cardinal Hayes / Archbishop of New York / Publishers / Burns, Oates & Washbourne, Ltd. / 22, D'Olier Street / Dublin / Made in Belgium.